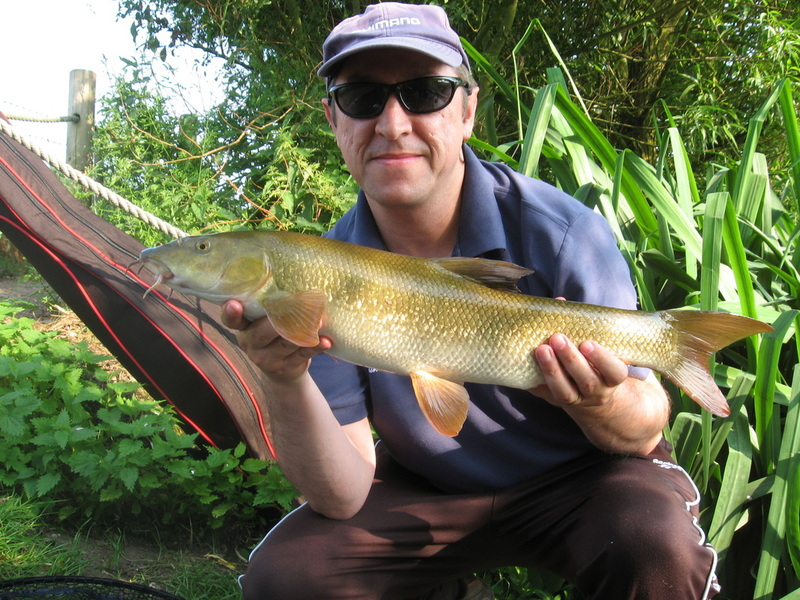 My wife and I visited the VAC club stretch of the River Lea at Marford to see if I could catch my first river barbel. We arrived at this very popular venue at around 4.30pm to find most swims taken, we managed to drop into peg 11. I set up a cage feeder and a float rod with centrepin, mixed up some marine halibut groundbait to plug the feeder with and got fishing just after 5pm. After getting organised and making a start with the feeder, we tucked into some grub we took with us and a nice cold drink. A few casts with the feeder of pellets plugged with the groundbait and also loosefeeding some pellets brought a couple of indications, then wallop! over went the tip and I was into my first ever river barbel. After landing the fish I unhooked it then let it rest in the landing net submerged in the edge. My wife took a couple of quick photos and then I realised I had not packed the scales, I didn't mind too much as the fish was an average size for the venue of approx 5lb. After another 30 minutes with no more bites, tried the stick float for a while but only managed one chub. Next time I get a chance to visit, definitely going all out to catch barbel on the float!